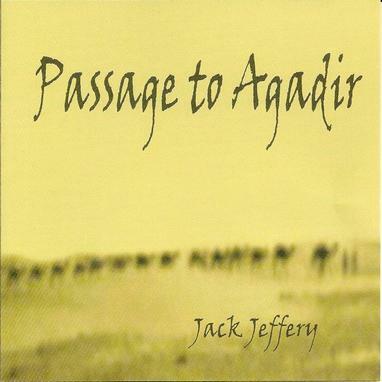 Jack Jeffery – "Passage to Agadir"
It’s a difficult thing, to record an album that straddles a number of different styles and still somehow make it a cohesive effort. Pink Floyd, back in the day, were masters of this, effortlessly sliding from strummy acoustic sing-a-longs, to gritty rockers, to ambient space journeys while always somehow managing to sound like Pink Floyd. Jack Jeffery is one of these artists who can pull it off, so it’s no surprise that he cites Pink Floyd as one of his major influences. Passage to Agadir is an album of contrasts, from the weary classic rock opener, Whiskey Burns, a great ‘rock n’ roll is a vicious game’ kind of song to the dark, dreamy ambience of the instrumental title cut to the fragile acoustic honesty of Being Myself. But Jeffery isn’t a Pink Floyd imitator. In fact, ‘Being Myself’ is exactly what he’s doing. His songs ring out with the passion he has for both his influences and his own music. It helps that Jeffery’s fragile, yearning voice is so sincere. When his lyrics occasionally lapse into cliché, you still believe in what he’s singing. But of course, as I’ve said, Jeffery is not just a good singer-songwriter. He’s more adventurous than that, and that’s why we’re reviewing him here in Aural Innovations. At least half of Passage to Agadir consists of more experimental explorations, from the aforementioned title track to the weird, hallucinatory Where’s the Ambient Jam? to the raw, folksy thunder of Acoustic Mojo. Jeffery even gets his freak on for the excellent, eerie psych rocker Mind Horizon. The final 20 minutes of the album is all instrumental exploration. As much as I love instrumental music, some of this didn’t work as well as the rest of the album. The 11-minute long Interstellar Echoes on the Dark Side, an obvious ode to early Pink Floyd, felt a little forced and stiff at times, at least in its rhythmic parts. However, the ambient sections were, well, stellar. Jeffery does ambient quite well. Even more successful, however, are Parsonian Segue and Overture for Galaxies and Stars, where Jeffery piles on layers of electronic rhythms with orchestral swells and guitar breaks in a much more organic fashion. So while perhaps Passage to Agadir is not an outright classic; it does have its flaws; it’s still a remarkably self-assured debut from a promising voice. Whiskey Burns, Mind Horizon, and the soft and spacey You’ve Lost Tomorrow are top notch songs, and the rest of the album shows Jeffery’s willingness to step outside the traditional bounds of song-writing and explore.